Word just in that the call for applications is open for this year’s UnionDocs Collaborative programme, which starts in September. I’ve posted before about UnionDocs, where I chaired a panel last Autumn, a very special screening /production space in Brooklyn, NYC. This will be their third Collaborative – a Masters-equivalent programme which offers a unique critical and creative exploration of non-fiction storytelling. “We are looking at what representing the real is, right now, in contemporary life”. That undertaking is manifested in work produced by the team members, see for example Mapping Main Street, in an inspirational programme of screenings and events, as well as in the pedagogic activity of the Collaborative. The one-year programme offers twelve early career media producers, curators and theorists a thoughtfully designed mix of mentoring, critical inquiry and production experience, all within a collaborative framework. The roster of people who have shown and discussed work at the UnionDocs “Documentary Bodega” Series of screenings, among them George Stoney, Nan Goldin, Jonas Mekas, Rosa von Praunheim, Vincent Moon, give a sense of the calibre of the place and the precious opportunity that the Collaborative programme represents. 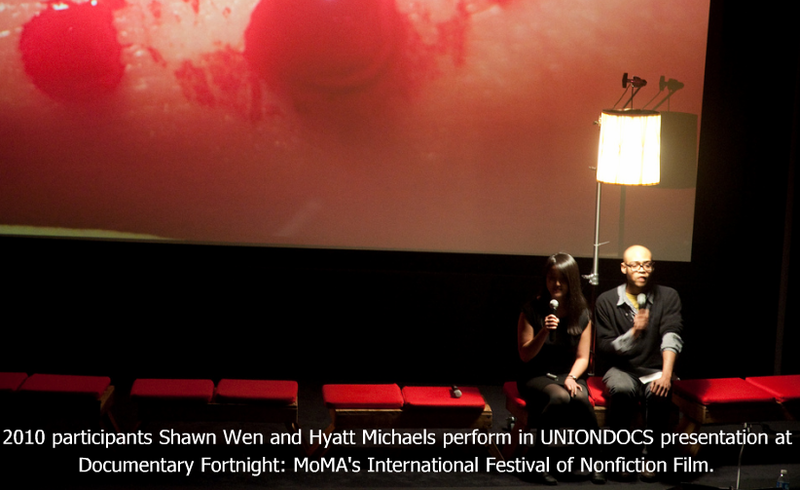 Find out more and apply for the programme on the UnionDocs site. i-Docs – Check out the Programme – Join us in Bristol!